The aim of FuzzyPhoto is to help researchers in the early stages of their research when looking for material most likely to be of interest to their studies. 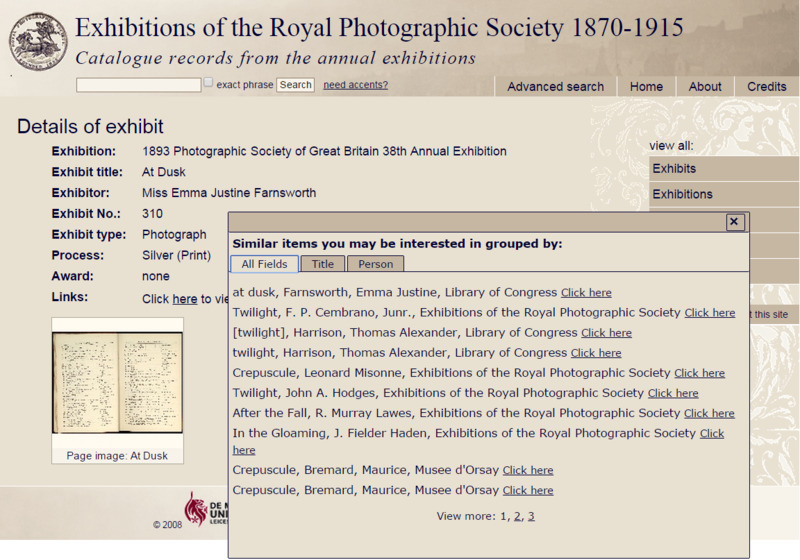 It finds similarities between photographic catalogue records in participating museums, galleries, archives and libraries. It is different from search engines such as Google that search the entire Web and often return many thousands of hits, many of which are only slightly related to the search query. It generates only a short list of suggested matches and it embeds them in the Web pages of participating collections so that when you visit a particular item page it will display links to other similar items in other collections. This Web site describes the project background, challenges, methods, and results.